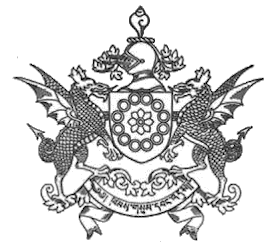 The two griffins symbolise the mythological horse of Indra as well as Tachog Balaha, one of the manifestations of Avalokiteshvara or Chenrezig. The eight lotus petals symbolize the Eight Fold Path which is to bring peace and harmony to Sikkim. The helmet, symbolising the defensive force of our land is crested by a conch shell which depicts the propagation of Dharma in Sikkim. The Kham-sum-ongdu has now been adopted by the Government of Sikkim as its official emblem. Why are they leaving contrails? Can anyone help me on Sikkim emblem ? Are this chemtrail or UFO !! Hope Cook as a Gyalmo ! !